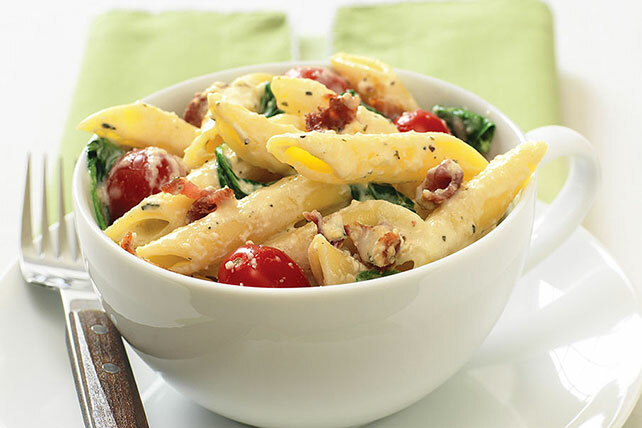 Here's a dressed-up version of a classic BLT, with bacon, baby spinach leaves and grape tomatoes tossed in cheesy penne pasta. Meanwhile, cook cream cheese, milk and Parmesan in large skillet on medium-high heat 3 min. or until cream cheese is melted and sauce is well blended, stirring frequently. Add all remaining ingredients except pasta; cook and stir 5 min. or until heated through. Prepare using 4 slices OSCAR MAYER Fully Cooked Bacon, chopped.